WireLuxe is a radically new knit wire, designed with a striated open weave center and tight knit edge. This unique combination creates a soft, flexible, lightweight knit with a firm structure that can be manipulated into different shapes by simply pulling one or both edges. 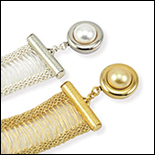 Jewelry artisans and crafters alike will love the versatility, metallic shimmer and rich colors. WireLuxe is also perfect base to wear as is or embellish - seedbead on it, glue-on flatbacks, weave silk, WireLace or wire through the center - just to name a few! • multiple style options - straight, curved, zigag or any combination. Now you can create a wide band necklace that curves, shapes, conforms and lays flat around your neckline! The 20mm width (approx. 3/4 inch) can easily be finished with ribbon crimp ends, bead end tubes to name a few. Note: due to the knit style - length, width and color will vary slightly. To curve, pull on wider edge to expand. To zig zag, pull each edge in opposite direction. If desired, slide wire smoother along edge to harden wire. Finishing with ribbon crimps: 1) fold over ends 2) position in crimp - teeth grip edge on folded side 3) squeeze crimp to secure then add clasp, chain etc. © 2018 Alacarte Clasps™ All Rights Reserved.